While the wealthiest taxpayers will gain financially if Republicans and the president successfully extend the Bush-era tax cuts in Congress, a group of millionaires and business owners said they will be disheartened if they pay less taxes next year. Members of the Patriotic Millionaires for Fiscal Strength, a group of 89 millionaires, petitioned President Obama to allow tax cuts on incomes greater than $1 million to expire at the end of the year, as scheduled. "It would benefit only the top less-than-1-percent, a huge benefit for them," said Saperstein. "I happen to be in that category, but it's still a bad deal for the public. If this deal goes down, the Republicans are going to demand that those deficits be corrected in some way. The public and working class people will end up paying for those deficits." Saperstein maintains that President Obama acted "like a lone ranger," without the support of his party. "I'm surprised that Obama is agreeing to them at all," said Saperstein. "The cornerstone of his campaign was that he would repeal Bush tax cuts for the rich. He has the power to do that today. He has the veto." Saperstein said he and his wife were staunch supporters of President Obama, donating the maximum legal amounts to his campaign since the Democratic primaries. 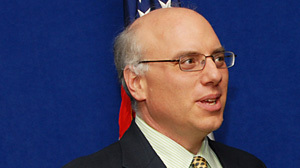 Saperstein also wrote an editorial in support of Obama in late 2007 for The Huffington Post, when Obama was falling behind Hillary Clinton for the Democratic nomination. Now, Saperstein said Obama has been a "gigantic disappointment and the weakest president in my lifetime of either party." Other groups also expressed their disappointment at the tax cuts. +Will Obama-GOP Tax Deal Help U.S.?